January 29, 2010 by Ken Ward Jr. The latest anti-mountaintop removal tree sit protest has ended, according this statement just issued by Climate Ground Zero. Two mountaintop removal opponents — Amber Nitchman, 19, and Eric Blevins, 28 — had entered their 9th day sitting atop oak trees at Massey’s operations in the Coal River Valley of Southern West Virginia. A third protester, 23-year-old David Aaron Smith, was originally part of the action but came down earlier when his equipment got wet. This protest had drawn interest from The Washington Post and the attention of West Virginia Gov. Joe Manchin. This was also the longest single action in the campaign of non-violence civil disobedience against mountaintop removal that started last February. Activists ended the protest because of the recent drop in temperatures and the approaching winter storm. Thanks, Eric, Amber, and David. That took courage and determination. 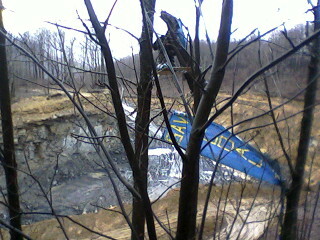 I really appreciate your trying to protect the people downstream from Massey’s sludge dam. Today is the 50 year anneversary of the Greensboro Lunch Counter sit in. tell how you expect the people to continue to accept the statement ” non violent ” disobedience when you folks are arrested and charged with carryig a concelled weapon. WV please see past the smoke screen these folks are throwing at you. I believe the ‘weapon’ was a small saw to cut tree branches with. Its important to get the facts.